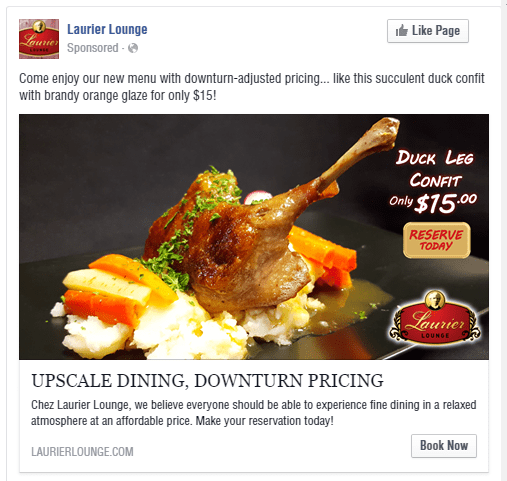 Turkey Burg began managing the Laurier Lounge Restaurant’s Facebook page and advertising in late January 2016. At that point, restaurant owner, Martin Maheux, had been experimenting with Facebook ads for a few months, managing everything on his own. While he seemed to be getting some traction with page likes and post engagement, he wasn’t seeing a direct impact on his sales and he didn’t have a lot of time to devote to his Facebook page. During their first meeting, Martin and Turkey Burg president, Adam Singfield, discussed a basic strategy and batted around a few ideas. Then Martin got to focus on running his restaurant and Turkey Burg got to work. 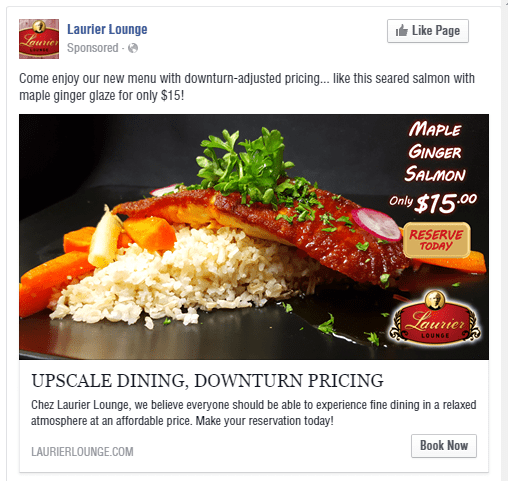 Under Turkey Burg’s management, the Laurier Lounge realized the following Facebook results without increasing its ad spend. The results below are from sponsored page posts and placed advertisements that ran Jan 24 – Apr 30, 2016. While Facebook stats are a good indication of audience reaction, it’s important to have a strategy that uses likes and shares to drive sales. As illustrated by the graph above, the Laurier Lounge’s monthly sales have seen a year-over-year increase of 18%. 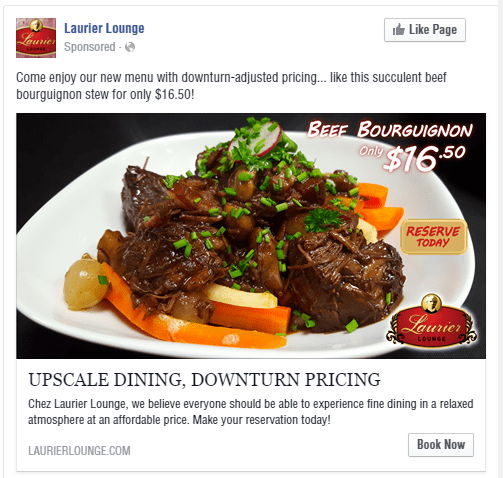 Using existing photos and creative assets to cost down, Turkey Burg developed a series of Facebook advertisements with the “Upscale Dining, Downturn Pricing” headline. The message was crafted for the local Calgary market and its struggling economy.